Plenty of signs point to ‘Ohope: NZ’s Most Loved Beach’. We spent a week on a powered site at Ohope Beach TOP 10 Holiday Park, a short walk over the dunes to Ohope Beach. 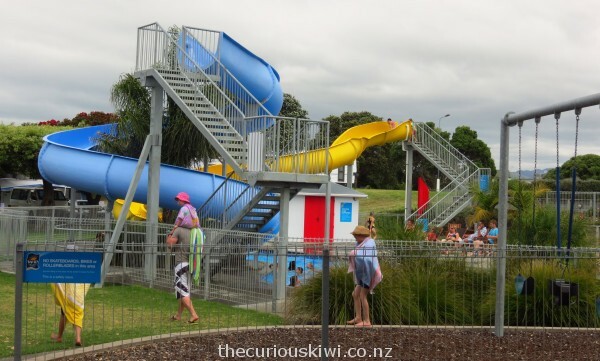 While Ohope didn’t take the title of our most loved beach from Waikanae Beach in Gisborne, we did find one of the most family friendly holiday parks we’ve ever stayed in. 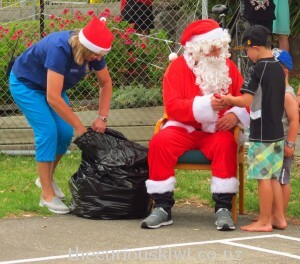 Father Christmas and his helper arrived at 11am on Christmas Day with a sack full of presents for all the children under 8. One lovely little girl sang Father Christmas a Christmas carol in thanks for her gift, I think everyone wanted to claim her as their daughter. A beach stay is a pretty good family present in itself but the holiday park adds plenty of cherries on the top for the kids. There is a big jumping pillow, two trampolines, a tennis / basketball court, playground, and a games room. The biggest hit for the kids though has to be the two water slides into the onsite swimming pool. The holiday park organises lots more for children over the Christmas holidays, all for no extra charge. You do pay a premium to stay over the holiday period though – powered and non powered sites have a $60 minimum charge per night from 10 December to Waitangi weekend. Cabins start at $150 per night, with two bedroom apartments being the most expensive option at $330 per night. It’s not just the kids who are catered for at the holiday park – the onsite Cabin 8 Cafe opens on Boxing Day and serves coffee, pastries, and fish ‘n’ chips. There were also a couple of pop up stalls selling clothing, and baked goods. 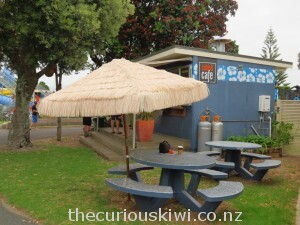 A new bar / cafe on the harbour opposite the holiday park should be open by now, and a short walk down Harbour Road you will find Port Ohope General Store & Cafe. 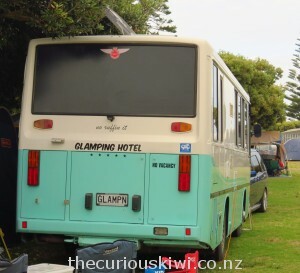 The sites really started to fill up on 27 December, it wasn’t all tents and caravans parked under the pohutukawa trees though, there was also a Glamping Hotel on wheels, sign written ‘no ruffin’ it’. Unfortunately there was no vacancy. We have more a cabin on wheels than a hotel and found the modern communal facilities well looked after and clean. There are plenty of free showers, although the kitchen facilities didn’t look big enough for the number of campers. However plenty of campers are self contained, if you’re not a holiday park regular you may be surprised to see cars pulling trailers loaded with full size fridge freezers, couches, and big BBQ’s. We even saw one tenting family with their own kitchen sink. 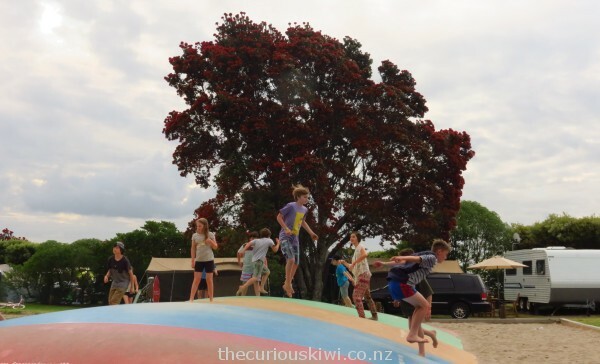 With or without your own kitchen sink, Ohope Beach TOP 10 Holiday Park is well set up for families and is a short walk to arguably the country’s most loved beach. 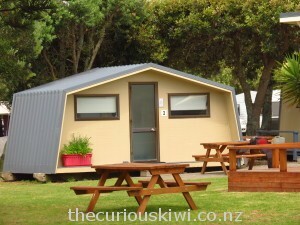 This entry was posted in Holiday Parks, Mt Maunganui / Tauranga / Whakatane and tagged Whakatane by thecuriouskiwi. Bookmark the permalink.